A hotel can easily make or break a trip, but staying in hotels as unique as these is not just part of the experience, it is the experience. Between structure, design, location, amenities, or any combination thereof, each of these one of a kind hotels provides its guests with an experience that can’t be found anywhere else. Stay in any one of them and you won’t want to leave the room. 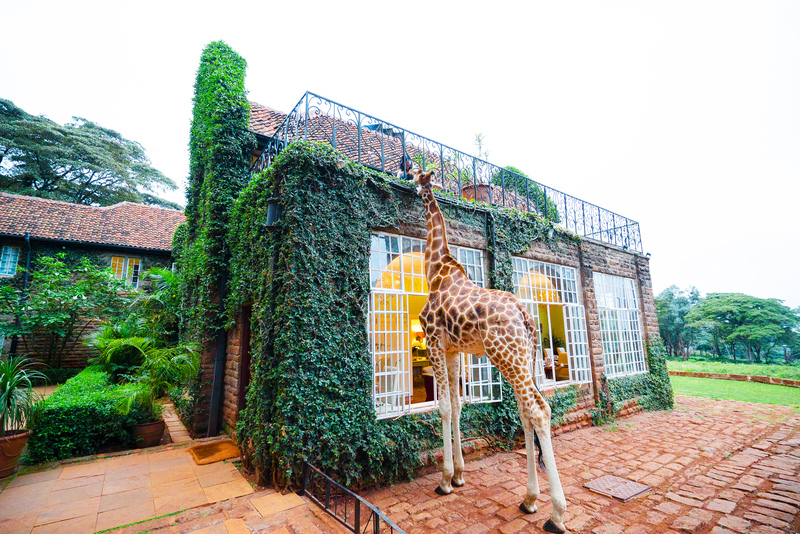 Giraffe Manor has 12 rooms, one of which was named after Karen Blixen, author of Out of Africa. For people who travel to Africa to experience wildlife, you can’t get much more up close and personal than Giraffe Manor in Nairobi, Kenya. Guests have the opportunity to interact with the giraffes from their bedroom windows when these gentle giants poke their heads in hoping for a snack. The manor’s gorgeous building and charming suites on its 12 acres of private land are practically an afterthought. Visit www.thesafaricollection.com for more information. Dog Bark Park Inn closes for the season between December and April, so be sure to plan your trip in advance. 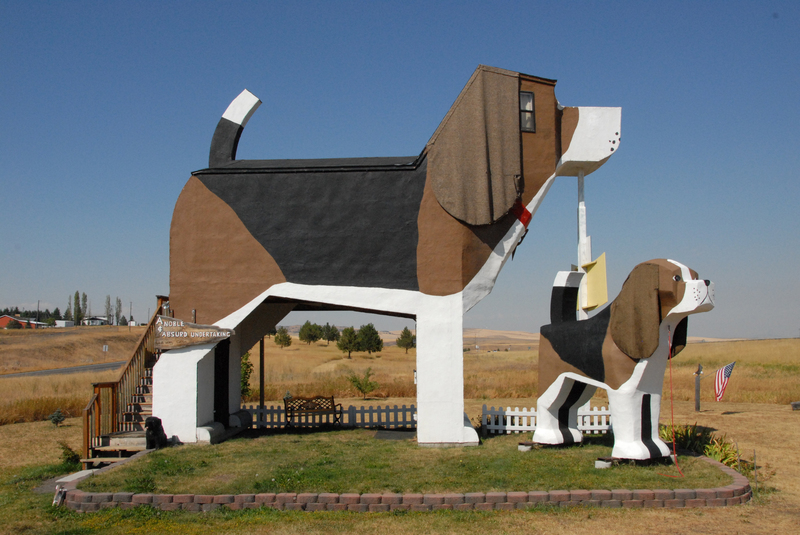 Should you ever find yourself in Cottonwood, Idaho, be sure to check out the Dog Bark Park Inn designed inside and out exclusively for dog lovers. This family owned bed and breakfast is nothing short of adorable. It offers one room and one room only, and it’s dog themed in every corner from bed sheets to board games. It sleeps four people and, as expected, it’s pet friendly, complete with a matching dog bed for four-legged guests. Visit www.dogbarkpark.com for prices and availability. For aviation aficionados and adventurous travelers alike, the Jumbo Stay is an airline experience you won’t soon forget. 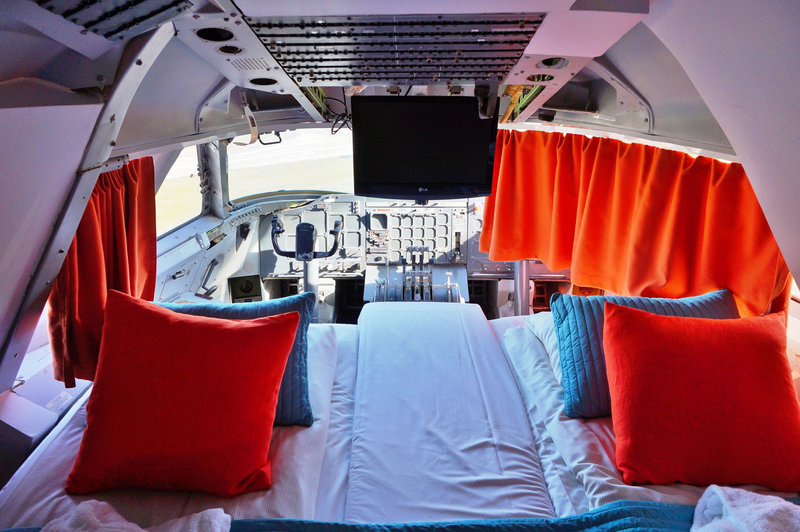 The Jumbo Stay in Stockholm, Sweden might just provide the best night’s sleep you’ll ever have on an airplane. Once a fully functioning aircraft that seated 450 passengers, this jumbo jet was retired and converted into a hostel in 2009 accommodating up to 76 guests. The plane’s most coveted room, however, is its Double Bed Ensuite Cockpit, which features many of the original controls from the aircraft’s days in the sky. The space is tight, but falling asleep beneath the night sky in the cockpit of an actual airplane is an amazing experience. Book a room at www.jumbostay.com. While each bed is built on an ice base, a mattress and sleeping bag ensure that guests stay warm throughout the night. 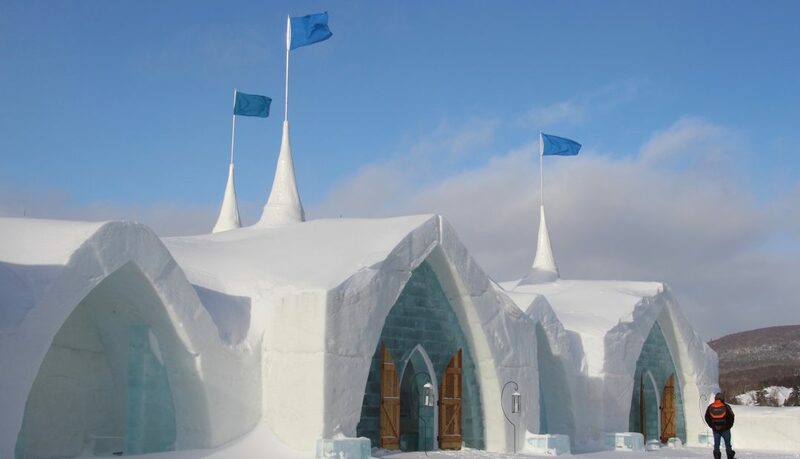 Even as ice bars are becoming common enough to be touristy, Hotel de Glace in Quebec is hard to beat. 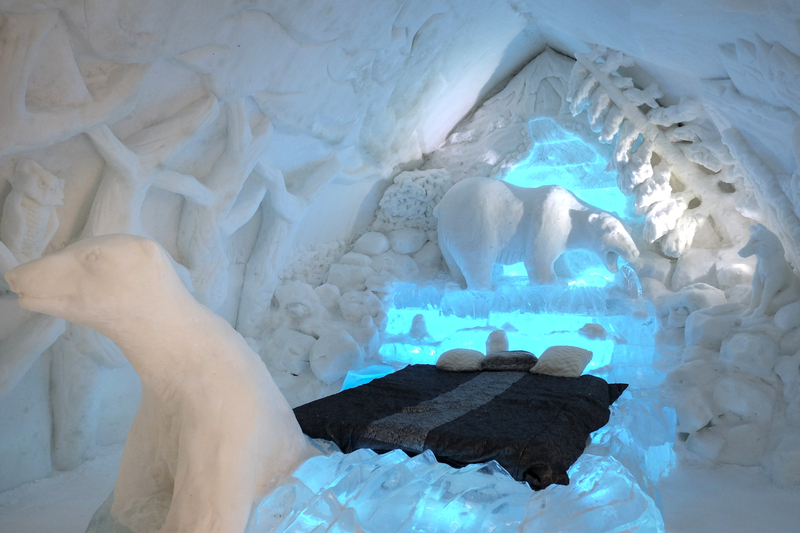 Built almost entirely out of ice, the hotel is a work of art. The walls in most rooms are lined with hand-carved sculptures, and guests can even opt for an arctic spa suite. Average temperatures inside hover around freezing, but some rooms are even complete with a fireplace to keep warm. Visit www.hoteldeglace-canada.com for booking information. If you’re looking for quiet seclusion, nothing gets you further from human contact than the world’s deepest hotel room. 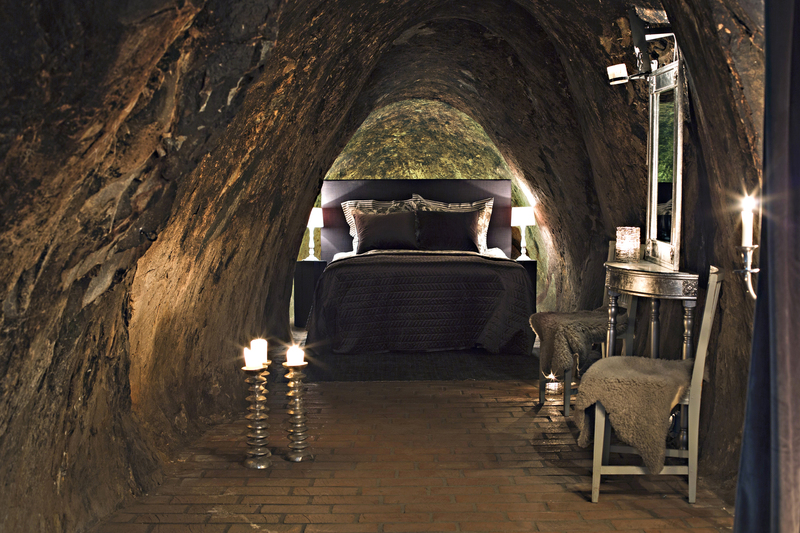 Located 508 feet beneath the earth, Sala Silvermine in Sala, Sweden offers the world’s deepest suite inside an underground mine. It accommodates only two, and the only access to a shower is back up at ground level. Intercom radios are provided for guests to communicate with the staff, as cell service is expectedly spotty. The suite itself is heated, but be sure to pack plenty of layers, as temperatures in the mine are typically just above freezing. For more information on the mine, visit www.salasilvermine.com.